Making Regular Yogurt Fro-Yo! Can You Freeze Your Yogurt? Yogurt Basics 101: How Long Can Yogurt Sit Out? What Is French Style Yogurt and How to Make It at Home? Making your own food at home (no matter what it is) is one of the best ways to ensure that you know exactly what is going into what you eat. You don’t have to worry about processed ingredients and other things that can potentially harm your health when you prepare everything yourself. Doing your research and buying the best yogurt maker can help with this. When people think of making their own food, yogurt is rarely the first thing that comes to mind because a large proportion of them believe that making yogurt is some complicated process. In reality, anyone can make their own yogurt, and it is even possible without a yogurt maker, though it becomes far simpler. Of course, there are a few different types of yogurt that you can make, and they feature different recipes. For instance, regular yogurt and Greek yogurt are not prepared the same way, so there isn't a single method that you can use to make all types of yogurt, and there are a few techniques to master. Don’t be too intimidated, however, as many of the best yogurt makers come with recipe books and guides on getting started with making yogurt. We would recommend taking a look at some instructional videos on YouTube as well. You should have an idea of what the yogurt-making process entails before buying a yogurt making machine. So how exactly are we going to help you find the best rated yogurt maker? Simply put, we'll be going over five different models in our best yogurt maker reviews. Of these yogurt makers, three of them will be optimized for regular yogurt while the latter two will allow you to prepare Greek yogurt. You may be wondering why it's so important to ensure that you get the best yogurt maker possible. There is a wide range of reasons to invest in quality kitchen appliances like a reliable yogurt maker; you'll save money on store-bought yogurt, a better, automatic machine will make the yogurt taste better and much more. After our yogurt maker reviews, we’ll be giving you a list of features to look for in the ideal product for your needs. Of course, if you have already bought one of these products before, it is likely that you already know exactly what to look for in a yogurt maker, so that section is entirely optional. Enough with the delays, however. Now that we have laid out the groundwork for our review guide let's get down to what you came here for. How Much Yogurt Can It Make? Regular Yogurt Or Greek Yogurt? When people ask what is the best yogurt maker overall, few products can hope to compete with this model from Euro Cuisine. This is a product that may not feature too many fancy bells and whistles, but instead, it is made out of high-quality components that are sure to last longer than the competition. The first sign that this product is made with care is evident before you even take it out of the box as it comes included with a 3-year warranty. Most yogurt makers of inferior quality tend to break down far before that point, mainly when you use them relatively often. It's nice to see a product that lasts. While this product may not feature too many fancy extras, it comes equipped with some features that make it easier for you to make your yogurt. For example, there is a high-visibility timer display on the front of this yogurt maker that lets you know how many hours you have until your yogurt is ready. In addition to the timer, the machine will beep when your yogurt is ready, making it much harder to forget it. I'm sure that many of us have made the mistake of leaving our yogurt in the maker too long, but that is a near-impossibility with this product. There are many other quality of life features as well. This model comes included with seven glass jars, each of which comes with its own label. You won't have to keep track of your flavors by eye, which can admittedly get confusing when trying to distinguish between different types of berry flavors or sweetened and unsweetened yogurt. As you can see, it is not just the reliability that makes this an excellent product, but it certainly seals in the YMX650’s reputation as the best electric yogurt maker on the market. On top of all of that, this model is available for a very reasonable price, offering some of the best value for money in the category. Check for the latest deal, and free shipping for Prime users on Amazon. While the previous yogurt maker was the best product for nearly anyone due to its low cost and its simple operation, you will find that this is a model for those who take their yogurt seriously. Cuisinart is known as one of the world’s best makers of kitchen appliances, and it is evident in this product. Many features help put this model a cut above the rest of the competition, and there are only a few drawbacks. To put it simply, if you can get past the cost of this product, then it will be the best yogurt maker that you will ever come across, but not everyone has such a large budget. Regardless, let’s take a look at some of the features that will help you make better homemade yogurt with this automatic machine. First off, it is equipped with a digital timer, a convenience that is present on most modern yogurt makers, but it is always nice to be able to see how far along your yogurt is at a glance. While this may be an advanced product, it is not exclusively made for experienced yogurt makers as you can operate the CYM-100 with little to no experience. 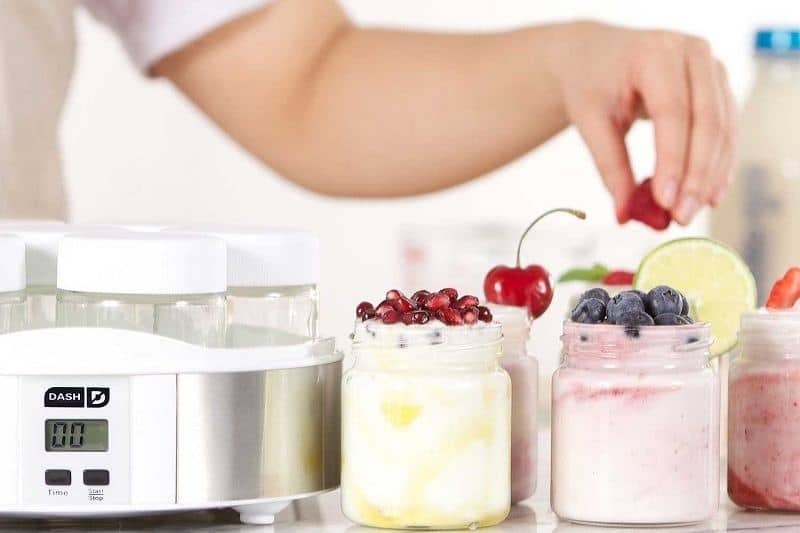 Since there are only four controls (extend timer, shorten timer, start, and stop), this machine can be used by nearly anyone, provided they know how to make yogurt. This yogurt maker features four-piece construction, being divided into a housing lid, a lid for the yogurt container, the container itself, and the housing of the entire machine. Since you can just take this yogurt maker apart and clean it out, you won’t have to contort yourself just to get to those spots that are hard to reach. As you can see, this is a yogurt maker that is designed for customers who want to make the best yogurt possible at any cost. 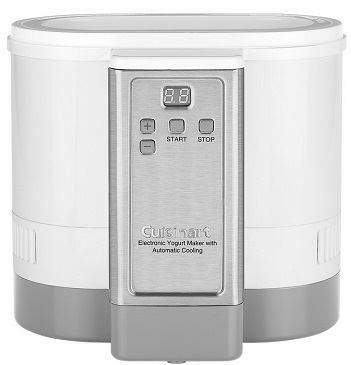 If you don’t mind paying a little bit extra for improved yogurt quality and reliability, then this machine from Cuisinart is unmatched by anything in the price range. Choosing the best yogurt maker is often a matter of balancing an affordable price point and sufficient enough capabilities. 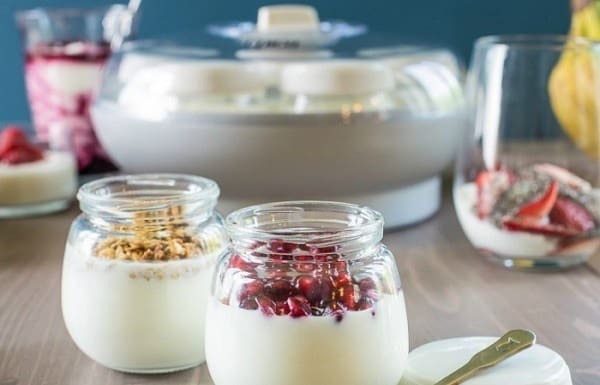 It seems like Gourmia has mastered the art of designing the most economical possible yogurt maker, so you can rest assured that you are getting the most bang for your buck. This product includes many things that you may not expect to find on a more affordable yogurt maker, including a recipe book that features over ten yogurt recipes and much more. When looking for the ideal yogurt maker, best rated products aren't always the best option as you can often save a good deal of money on an alternative. While the GYM1610 may be one of the more affordable automatic yogurt makers, it is still entirely safe, and the makers are trustworthy. Gourmia's customer service department is courteous and prompt, which is all too rare when you buy a kitchen appliance at this price point. This yogurt maker also features ETL certification; this means that you won’t have to worry about your machine short-circuiting or potentially harming you. ETL certification is only granted to products that can prove they abide by North American safety standards. When you purchase this product, you can either opt for a digital timer or one that doesn’t feature a timer in the first place. The model that we reviewed had nothing but an on/off switch which may seem questionable in theory, but in reality, it makes for a product that is simple enough for anyone to operate. Of course, no yogurt maker is entirely without flaws, and we feel that the model equipped with a digital time would make it easier to keep track of when your yogurt is ready. This product is also lacking when it comes to additional features, but you’ll find that it provides everything you need for the price. 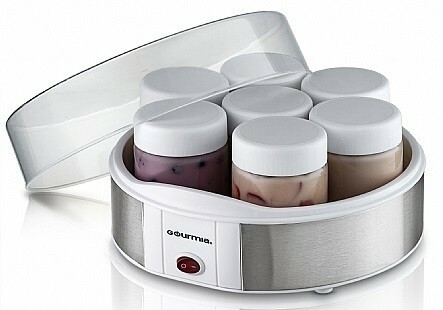 If you want an affordable yogurt maker, few options can hope to compete with this model from Gourmia. Getting fresh yogurt at home is a whole lot easier when you have something like the Yogourmet Electric Yogurt Maker in your kitchen. Its basic and straightforward design means minimal effort to get fresh daily yogurt, and it will save you hundreds of dollars over the year from buying expensive yogurt brands from the supermarket. This is a great product for those who want to watch their weight or are following a specific low or no carbohydrate diet. You’ll be able to put the exact ingredients in that you want and keep out any sugars, fats, or artificial stuff that you don’t want, making it a lot healthier than anything that you’ll find in the store. Keep in mind, there is still some work required with this machine. Although it will keep the ideal temperature for you so the yogurt can ferment, you’ll still need to boil the milk at the start and then lower it down before it cooks, so it’s not totally automatic as you might have assumed. 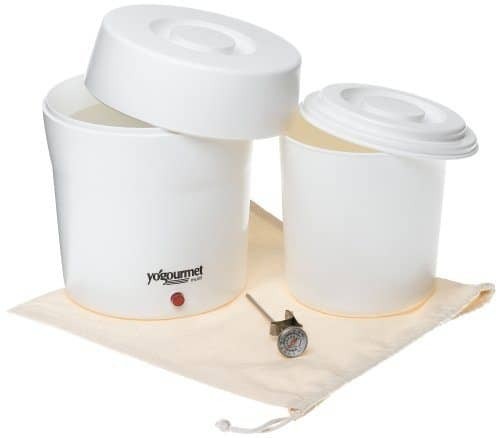 One handy thing that this yogurt maker from Yogourmet offers is a dishwasher-safe inner container. You can simply remove it and put it in the machine, and that’s as much cleaning up as you’ll have to do. In terms of mess, this is definitely one of the easier options to maintain so it’s perfect for people who might be in rush in the mornings when they enjoy their yogurt. 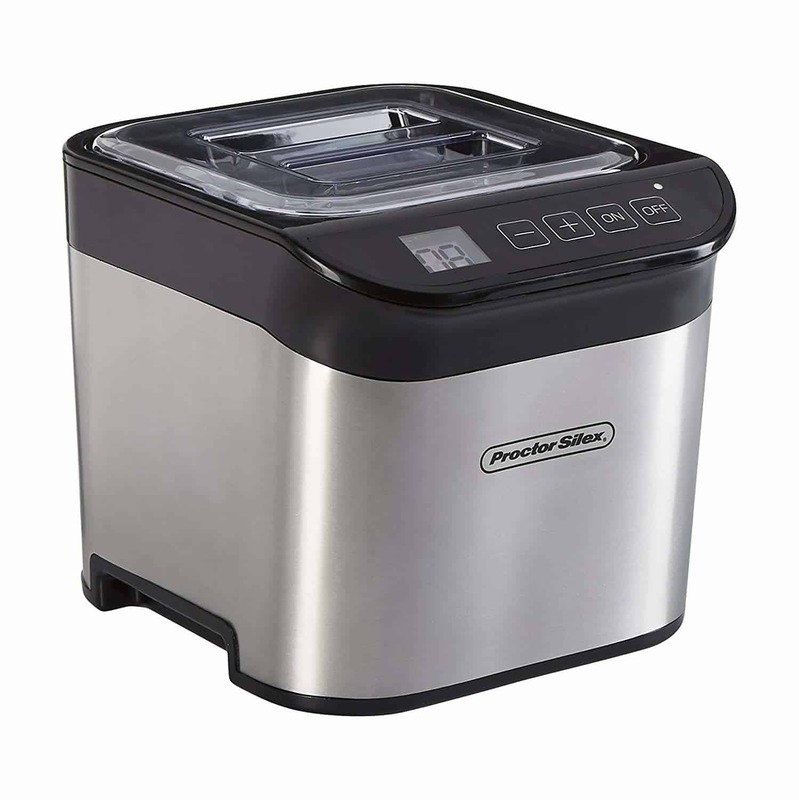 If you’re someone who really likes to ‘set and forget’ their meals, you’ll love the automatic functions of the Proctor Silex Yogurt Maker. You simply put the ingredients inside and then let it get to work, so there’s no transferring of anything to and from different pots and containers. One cool thing about this yogurt maker is that when you’re done making the yogurt, the container is also safe for the fridge. The whole thing pulls out and you can put it straight in the fridge to chill, further saving any mess or complication. There are buttons on the front panel that let you control the settings, on/off, and a digital timer that counts down until your yogurt is ready. They’ve designed this so the whole thing can be done on your countertop while you’re busy getting on with life or cooking other things. The only design issue with this yogurt maker is the container inside. Some have said it was too small, and others lamented the fact that there was no easy way to retrieve it from the machine when it’s done fermenting. You’ll have to get tricky and figure out a way to fish it out, but don’t let that put you off entirely. This is an affordable and simple yogurt maker without any fancy features that might make others complicated. It’s made from quality stainless steel and durable plastic for the container, so although it might be affordable it’s definitely got the right materials to survive for many years to come. 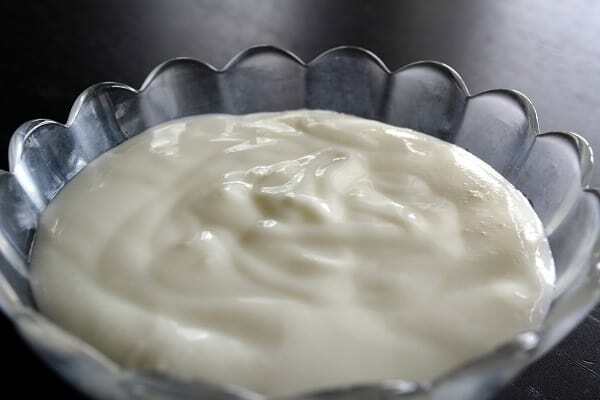 Different types of yogurt will have varying temperatures that can be considered ideal for fermentation. You will find that the most advanced yogurt makers on the market will allow you to select that temperature while others will simply have a preset temperature that should work for most yogurt. Adjustable temperature is still relatively uncommon in home yogurt makers. This feature is more common in commercial models because there are often professionals working with them who know the intricacies of minute temperature differences. Regardless, if you are serious about yogurt, adjustable temperature settings will help immensely. Another thing to account for before making your purchase is the amount of yogurt that your machine can make. This will depend on a range of aspects, but it is mostly related to the volume of your yogurt maker or the number of jars that you can fit inside of it. Larger machines will be able to fit a more substantial number of jars, which not only increases the overall volume of yogurt that you can make, but you can also choose different flavors. Many yogurt makers will come included with a set of labels that you can use to keep track of your flavors. When you are done making your yogurt, there is one last thing that you will have to do, and that is cleaning your yogurt maker. Dealing with a yogurt maker that is hard to clean is one of the most frustrating experiences because yogurt tends to get everywhere. If you are looking to make your life easier, you will want to invest in a yogurt maker that is either dishwasher safe or features components that are. Other than being dishwasher safe, some yogurt makers are designed to minimize the mess that you have to deal with after you are done. When deciding on a yogurt maker, you will have to consider whether you want one that is capable of making Greek yogurt or regular yogurt. You will find that Greek yogurt tends to have a bit more of a sour taste to it than regular yogurt, and many studies laud it for being healthier. In the end, your choice of yogurt is entirely up to personal preference. I would recommend trying out several brands of both yogurt types and then deciding which one you like more. If you are looking into buying a yogurt maker, however, it is likely that you already know what kind of yogurt you enjoy most. If you're specifically looking for a Greek Yogurt maker see our buying guide. Most yogurt makers will be able to ferment your yogurt in about 8 to 12 hours, but certain types will need a bit longer to reach their full flavor potential. 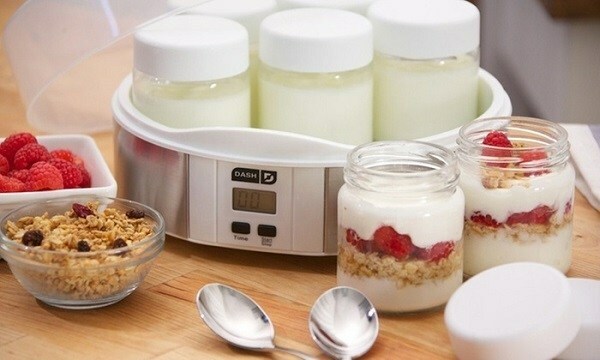 Most yogurt makers will come equipped with a timer that lets you keep track of how long your yogurt will be fermenting. We hope that this guide has helped you find the best yogurt maker for your needs. There are so many more excellent products on the market, but we firmly believe that this a selection of the absolute best around. Feel free to leave a comment down below and let us know what you think.